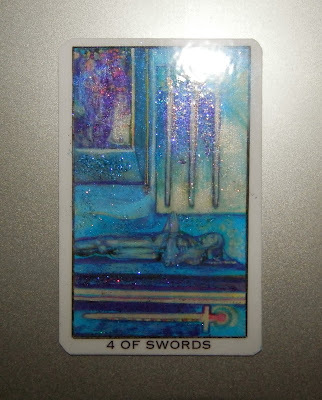 Weekend Reading: Four of Swords from the Dark Crystal Glitter Baby from Carol Herzer. This weekend's message is literally "rest". It's time to take a break from the grind and recharge. I'm sure you're all thinking, "duh, it's the weekend." I agree. Also, the second I turned this card over, I thought, "I can rest some other weekend. This weekend I need to get stuff done." After all, it's the prime time of the year for winterizing your garden. Then there's all that other stuff you have to do on weekends. Then it hit me...the cards know weekends are for resting. And they also know that what we REALLY use them for is catching up on family stuff and stuff around the house. Which means we never really get a break. So somewhere in all of the stuff that needs to be done, be sure to carve out some time to indulge that part of you that needs a break. Take a long bath. Turn off the phone. Meditate in nature. Do SOMETHING that doesn't involve you doing something or thinking something. Make some time to give it all a rest.